Hi there. I started writing this entry on focus in early September and here we are in early November, which is just to say that I am obviously the expert on the topic of focus. There are so many great things to write about, where to begin? Maybe I need to heat up the coffee first. And there is a hangnail to trim. With that disclaimer, back to our original topic. This Fall, I'm ready to focus on focus. Caroline Fraser says, "the students were focused because the teacher was focused." Yikes! That is a lot of pressure. I resemble that remark. And I'll take responsibility for the child's focus at the lesson. Here are some thoughts about focus, in no particular order--how's that for a start? No child or adult can focus on-demand. Telling someone to focus does not help them focus, In fact, when a parent interrupts the lesson to tell the child to focus on the teacher. . . think that one over. "Honey, sweetheart, deer one, CHILD, listen, please, please, listen to Mrs. Kotrba." Yep. Now the child is officially actually listening to the parent. Parents can help their child by saying as little as humanly possible during the lesson. Every time the parent speaks it takes the child out of the teacher student bubble. Pop. Taking a bow as soon as possible after walking in the door helps the child. Email me, text me, hand me scribbles on the back of a napkin on your way in, but starting the lesson with a parent teacher cconference while the child meanders into finding a book or toy is not our best routine. We greet each other with a brief sentence or a positive report and off we go. Of course there are exceptions. Keep them as exceptions. I'm guilty too. Decide which sibling is taking the first lesson. My first choice is youngest to oldest. When you talk about lesson order, make sure to be mindful of your language. For example, "Johny, would you PLEASE go first, then you can get it over with and relax and do something fun." As if the lesson is some type of torture that must be endured before we can get on with our pleasant day. Scooping the cat litter is something I want to get over with. Playing piano with Mrs. Kotrba? That should be something we look forward to. If you can't stick with youngest to oldest at least have an established routine. No discussion. And expect that the child will be ready to bow and start the lesson with no shinanigans. Is your child so tired? A limp and lifeless bow? Even though they seemed very perky in the car on the way? Slumped at the piano? After they ran up the stairs? I'm going to end the lesson and send them home with specific instructions to go to bed early. An hour early. Remember. . . I'm pretty good at distractions and fresh starts. . . this last resort is the million dollar lesson that Paula Bird talks about. Ending one lesson early because the child is testing the waters will save a lot of wasted time. A lot of wasted time. I can be positive and cheerful until the cows come home, but it takes a lot of time and quite frankly, it's your time. When and if I end the lesson early for shenanigans, back me up here, put the child to bed early. I try to use toys and counting objects sparingly and thoughtfully. I have an enormous collection of counting objects. I love them. A lot. It's fun. It shows the work. Putting a little animal up for each tasks has many merits. It's also ripe for distraction. Not every child can handle this. There are rules involved as well. Does the child get to pick the animal? If so how long can he take to choose it? What are you going to do when she starts to play with them? We have opened the box. The rules are, you can't play with them. You have to pick one before I count to five. We are here to work. I've had good luck increasing focus simply by setting up a stillness before playing. Counting to five while the child looks at a little animal, completely still, is really a miracle in a moment. Establish stillness, then bring your hands up, take a breath, and begin the piece. Miracle in a moment. What about all those things we have to talk about? All the questions? The myriad interesting things in the room and my fuzzy sweater and the state of the world in general? If it doesn't have to do with piano and even specifically the task at hand? Ignore it. Don't even respond. Damaging to the child? No. After the final bow I might ask her what her question was again. If we entertain every inquiry we invite more and more inquiries. Kids are smart. Really smart. Ignore the unrelated. They figure it out very, very quickly. For that matter, ignoring all undesirable behavior goes a long, long way. The golden rule? Give more attention for the positive behavior than for the annoying or distracting behavior. Ignore everything that you can. Exception: anything that falls under the ten commandments: lying, stealing, hurting sister or mother. . you get my drift. Matters of the heart should be talked about. Matters of annoyance? Ignore. What other tactics do we have to increase focus? The one point lesson. Ask a lot of questions. Play simple games like putting down a playing card everytime he does the main point correctly. Games, when done correctly, are wonderful learning tools. I taught my son for twelve years using every imaginable game. Mary loves games too! You are never too old. Working on perfect repetitions increases focus. Break it down to the smallest chunk or slowest tempo, but get it perfect. Our brains learn best doing small high quality repetitions. Final lecture of the day? Social dynamics. Keep them ppp. That means parents and siblings shouldn't be heard during indiviual or group lessons. At all. Do not read to the younger sibling in the back of the room. What do you think the child at the piano is thinking? He's wishing dad was reading to him. Give your child your undivided attention. Sibling will figure it out. She is not more important than the lesson at hand. Lastly, when two parents are chit chatting during group what do you think the teacher is thinking? She's wishing she was chit chatting with parents too. That's a joke. But still. There is nothing I want more than community, except. . . focus. Those are my thoughts. It's taken me about thirty years to learn some pretty simple lessons, and about two months to focus enough to write them down, but they might save you a lot of time and frustration. As you reflect on what is going well and what needs work, like Dr. Suzuki suggests, start with one idea, and try that for a month. When that idea is established, move to another idea. Decide sibling order before the lesson. Don't talk with other parents or read to siblings during the individual or group lesson. Ignore most distracting and anoying behavior. Bow as soon as possible upon entering the lessson or transitioning to the next lesson. Use the miracle moment--five counts of stillness before breathing and playing. Give a lot of attention for positive behavior. Collect perfect repetitions, snippet by snippet, slow to fast. Never, I repeat, never tell your child to focus. Let the teacher have their attention. I'm not perfect but I'm the one who needs the child's attention. No one can tell another person to focus. It's an oxymoron. The good news? Studying music does increase focus in children. It's proven. Karen Hallberg pubished her dissertation on the positive effects of Suzuki study on the attention span of kindergarteners. We are not surprized by the results, but it's pretty cool to have the stats. Contact me and I'll send you her info. In the mean time, enjoy the time with your children and remember the words of Jeanne Luedke: we are either teaching the child to focus, or we are teaching the child how not to focus. Best wishes. Right now in my studio we have many siblings. That is wonderful! It's also a bit of job security for me, nod-nod-wink-wink. 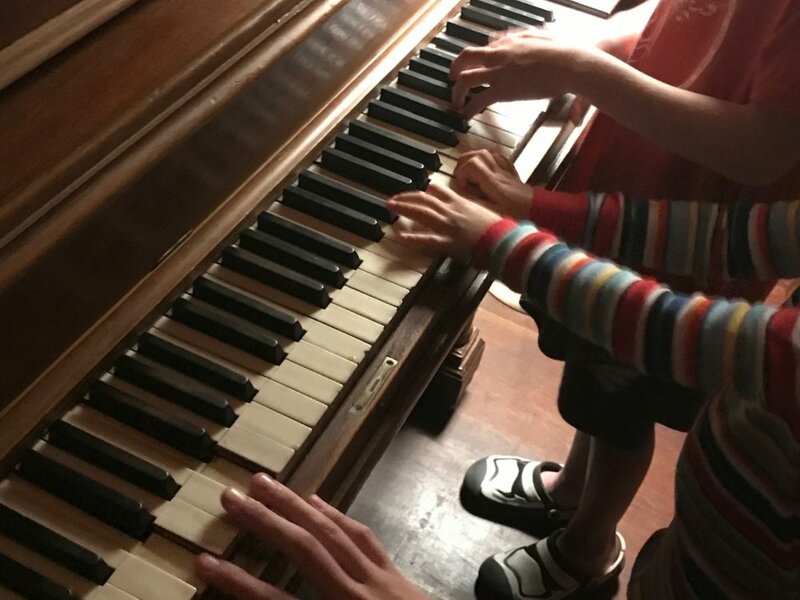 Having siblings present at lessons and group lessons helps to prepare them for future music study, whether it is at the piano or another instrument--we are subscribing after all to the mother-tongue approach--ability development from age zero. If children are observing from the time they are babies, they will have a lovely background to start lessons as soon as they are ready. They already know the protocol and routine of the lessons. They know how I am and what my expectations are. There is a level of trust and anticipation. They see the other children loving lessons and loving music. They are ready to start. It's all good. But. . . there is a small issue of getting these little cherubs into a routine. Our first responsibility is to the child or children in the lesson or group lesson. Their learning comes first. We have to protect their ability to focus. This time is special. It feels to me that there are three stages to siblings in the studio, babies, toddlers and littles. Let's talk about each of these groups. Babies are wonderful. They generally nurse or sleep. They cry and mama settles them down. Eventually they sit on a blanket on the floor and hold a toy and clap when we clap. This is the calm before the storm. Toddlers are tricky. They walk and talk. They are innocent and loud and mobile. Developmentally they are just starting to learn communication skills. How in the world can we make observation a positive experience for everyone in the room? Of course we start from a philosophy that every child is unique and every family has a parenting style. There may be times in the child's growth when he or she is just not capable of being in the lesson without disruption. That's okay. Parents may need to invest in a sitter. Parents of toddlers, you are already investing in lessons, protect your investment. This is not forever. This window of time seems long but it's only a few short months. When the sibling is able to obey your request to be quiet and still, they can observe the lesson again. While you transition to this stage, please step out of the studio when the sibling is too loud. This is not a punishment. This is a courtesy to the older child. Hold your child outside the door until they are settled down and then return to the studio. Like I said, this is not a punishment, but neither should it be a reward. Don't make stepping out more fun than being in the studio. Stay quiet and listen through the door. I will review any portion of the lesson that you miss at the end. Littles are the best! I have a basket of beanie babies and a shelf of books. They can play quietly or color at the table. Do not give them your phone or an iPad. They are learning from the piano lesson too. No electronic baby sitters in the studio! (Teacher and parent set this example by having their own devices set aside). Teach siblings that the parent's attention is primarily on the lesson and they need to be taking notes. In my studio there is a seam in the carpet which divides the room. Parents and siblings remain behind this line during the lesson. Even babies understand this very quickly. Parents and siblings are outside the sightline of the student. When parents and siblings are quiet it facilitates the student's complete focus on me. Every interruption breaks the flow of the lesson. Of course interruptions will happen, but make them the exception rather than the rule. Do not underestimate little children's ability to be calm during the lesson. This has to be taught, but what a joyful reward we get! A couple weeks of stepping outside, for several years of focused lessons. Side note to parents, make sure that you have a special time set aside for the younger sibling, when he has your complete attention and the older child gives him respect. I believe this is important and fair. As far as practice at home goes? I'm here to tell you that when Calvin was 4-6 and Mary was 1-3 I stuck her in the playpen in the living room while I practiced with Calvin. She was safe and learned to play by herself for increasingly long periods of time. Then when he went to preschool then she and I read and sang songs together. Parents will have to find their own comfort level and routine. Group lessons. . . at last count, I had six siblings in the room in addition to parents and the eight children in the actual group. Folks, that's a lot of bodies in a room. We are going to need some crowd control in order to have a productive hour. This year I'm going to set up the half circle of parent chairs with some space behind them. Siblings will need to be behind that line or at the table. The same rules apply. Parents should give their primary attention to the group. If the sibling is loud, remove her. This too shall pass. Parents, you are giving your child the gift of being able to quietly entertain herself for one hour. Recitals. . . please gauge your tolerance of noise to the formality of the recital. In general, parents with babies should sit where they can make a quick exit when baby cries. Be more considerate to others than you are to yourself. Lastly, during individual graduation recitals, please assign an adult, such as the non-practicing parent, a grandparent or friend to be in charge of each younger sibling. When and if that child becomes fussy, the assigned adult will immediately exit the room with the sibling and take them as far away as necessary to not distract the performer. The graduate has worked hard and deserves the complete attention of the practicing parent, teacher and guests. The child who has observed lessons from a young age easily transitions to becoming a student. Think about the hours she spent listening to instruction before she started. She has a wonderful library of sound in her ears. Hopefully these notes will help make these years positive and productive for everyone involved! I think the single most important pedagogical idea for teachers and parents is having a main point for the lesson and/or practice session. When you observe master teachers you quickly see that they have a very strong idea of the point that they are teaching and they weave it into the entire lesson. Edmond Sprunger calls it "Shooting One Arrow" in his book Helping Parents Practice, Ideas for Making it Easier. Jeanne Luedke, one of my favorite parent educators, names it in her top five sticking points. When you hear your student or your child playing a piece, you may have a lot of things to say. You may notice a dozen issues that need to be addressed. Throwing the book at the kid will only cause discouragement. Discouragement leads to resistance. Who wants to be told a millions ways in which they need to be fixed? Having one main point reduces resistance because it allows the child success. Contrary to popular opinion, none of us can truly multitask. When we address one element of playing, we can succeed. This makes us confident to tackle the next task. Don't we all love checking things off our to-do lists? Success leads to success. Sticking to the main point may be more difficult for musical parents than for nonmusical parents. Parents with a musical background will notice more things to fix in their child's everyday performing. They will have to make a conscious effort to focus only on the idea that the teacher singles out. I try to confirm the main point with my students and their parents before they leave the lesson. I write it on the lesson plans I make for their next lesson. It is my goal to follow through on the main point at next week's lesson. An example of a main point might be to listen for balance between melody and accompaniment for piano players. It is enough to listen just for balance. Ironically, I often find that once the student is completely focused on their point, many other small issues solve themselves. Pope John XXIII had a motto: See everything, overlook a great deal, correct a little. We are on this long journey, a good teacher will prioritize and important issues will not be overlooked forever. Please have faith in this process. Picking a main point allows the student, parent and teacher to focus their efforts, improve one element and feel successful. Write it down. Remember it. Follow through with it. That is the main point of the main point.